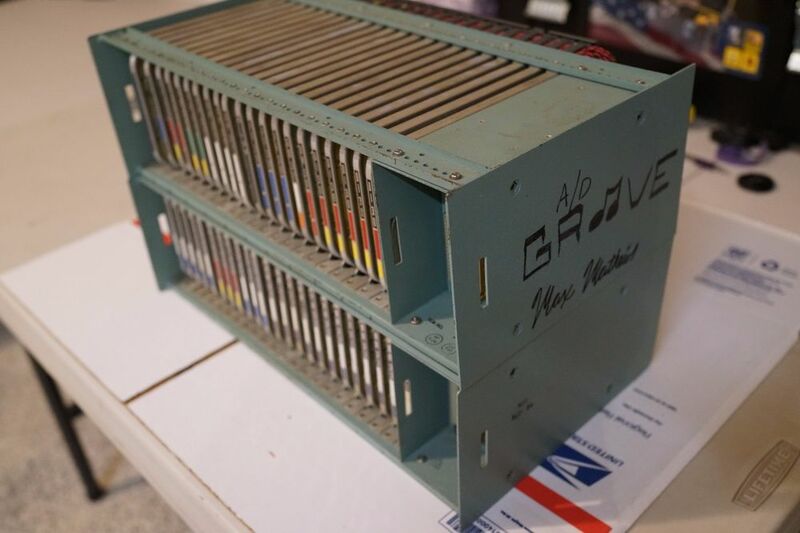 GROOVE is a hybrid system for sound synthesis and control in real-time, developed in the seventies by Max Mathews and Richard Moore. Introduction – The GROOVE, an acronym for Real-time Generated Operations On Voltage-controlled Equipment, has been one of the most popular hybrid systems for the sound synthesis and control in real time. Antecedents to the GROOVE are two other similar projects: one developed by James Gabura and Gustav Ciamaga, the PIPER, and that of Lejaren Hiller and James Beauchamp, never completed. for this reason, still remembers the American researcher, not had the chance to play the computer like a traditional instrument, such as being able to act on the characteristics of sound in the execution phase. Still respect to performance, the use of computers in the presence of other performers was quite complicated. From considerations of Mathews is clear that the main problem was not so much the sound synthesis, which was concentrated with Music N, but its live handling. In its diversity, then, this research can be said to fill in those aspects that previous work had not been investigated. If with the Music N, Mathews had worked exclusively on the computer, within a digital system, with the GROOVE try the combination of analog and digital devices. History – Max Mathews and Richard Moore began working on the GROOVE since October 1968. It was already operating in that year but over the next two years several changes were made, specifically designed to meet the needs of advanced users. The GROOVE, in its final version was presented to the international community in 1970, during a conference on Music and Technology in Stockholm organized by UNESCO. Among the participants also several leading figures in electronic music such as Pierre Schaffer and Jean-Claude Risset. Work Method – From a technical point of view, it was to alleviate the workload that was submitted to the computer’s CPU. The obstacle could bypass entrusting the synthesis process, which required the greatest amount of calculations, to the external analog devices that can work in parallel with the computer. For this reason, the GROOVE was supported by an external modular synthesizer, which is useful in sounds generation and filtering: MOOG filters, envelope units, ARP oscillators and other modules to voltage control developed directly by Max Mathews. 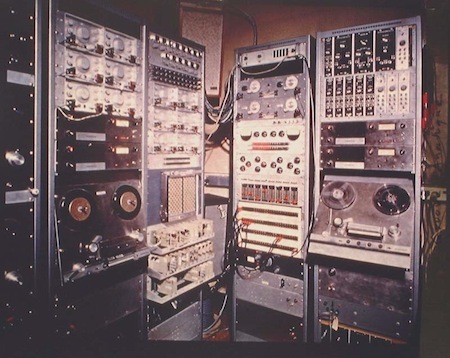 The computer would take care of the control functions to be performed in real time, on the sounds generated by analog devices. By integrating the analog synthesizer for the sounds synthesis, is guaranteed to save time in computing the data, that it was about 5-10 milliseconds. Sure it was a value that was only close to zero, but for computers power of the sixties was absolutely unbeatable. The model which looked Mathews for the design of the computer part of the GROOVE was not so much the performer and his instrument, rather than the model offered by the director in front of his own orchestra. The computer, in fact, was not concerned to synthesize the sounds but to read a score stored and made expressive by human control. A color photography of the Groove. The numeric functions to generate electrical voltages could be updated at a rate of 100/200 times per second, against 10000/50000 of the digital sounds synthesis, so you understand the reduced weight of the control functions on the CPU. To this list of devices is also added through a display which to view, in real-time, the graphical output of the input data for the generation of the control functions. The presence of a disk storage was another very interesting. This could save the data of the programming, or the way in which a controller was used. 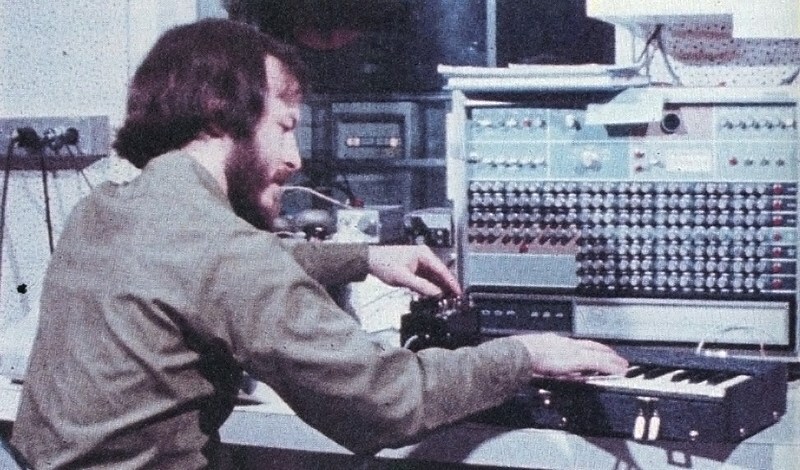 In a following phase, recalling these data, we could perform several actions: adjustment control on the sound material, mix together the different actions, you can listen the complete work, or even individual portions, to which it was possible to make any changes, then to run the entire composition to the computer through the reading of data stored. Music by Bach and Bartok were performed with the GROOVE at the first demonstration experiments. The ADC of the Groove System, firmed by Max Mathews. The heritage of GROOVE – From what has been said, I think it is clear that in the hybrid system of Mathews and Moore the real-time question does not arise in terms of digital synthesis, but rather acts as a survey on digital control of sounds. The fact remains that this experiment has provided important stimuli, both immediately and after many years. In recent years, for example, the project Sensorband still refers to experimentation on the GROOVE. In those years, however, was Pierre Boulez to become interested in the project of Mathews, in particular fascinated by the performance aspect that characterized the hybrid system. For this reason Boulez called Mathews to work on a new project, which would have led to the development of the Radio Baton. Conclusions – The GROOVE was used for little more than a decade, from 1968 to 1980. Beyond the legacy, the same Max Mathews recognized the unpopularity of his system, at least in a commercial perspective. The biggest obstacle was the high construction costs, it took about twenty thousand dollars, a considerable amount in those years. For this the only model in circulation throughout the years of activity, it was always just that of Bell Labs. Tea Hong Park, An Interview with Max Mathews, Computer Music Journal, Vol. 33 , 2009. Max Mathews, Richard Moore, GROOVE: A Program to Compose, Store, and Edit Function of Time, Communication of the ACM, Vol. 13, N&deg;. 12, 1970. Richard Boulanger, Conducting the MIDI Orchestra, Part 1: Interviews with Max Mathews, Barry Vercoe, and Roger Dannenberg, Computer Music Journal, Vol. 14 , 1990.